The values in our world and society are shaped by people, and can be changed by people, too. 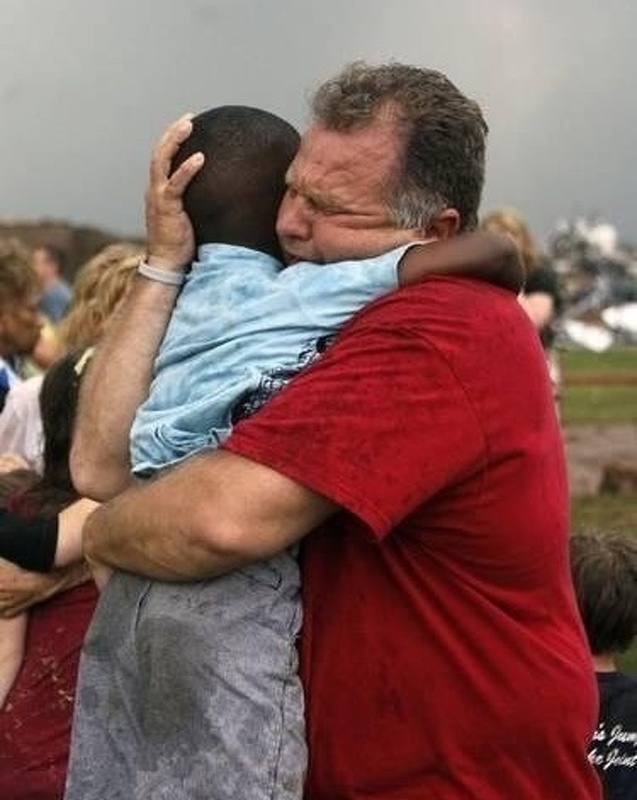 Good will is needed in order for the needs of all human beings on Earth to be met. These 15 teachers and moments restore our faith in humanity, because they really care about their younger or elder students. We should appreciate such people, because the amount of dedication and effort they put into their work is enormous. 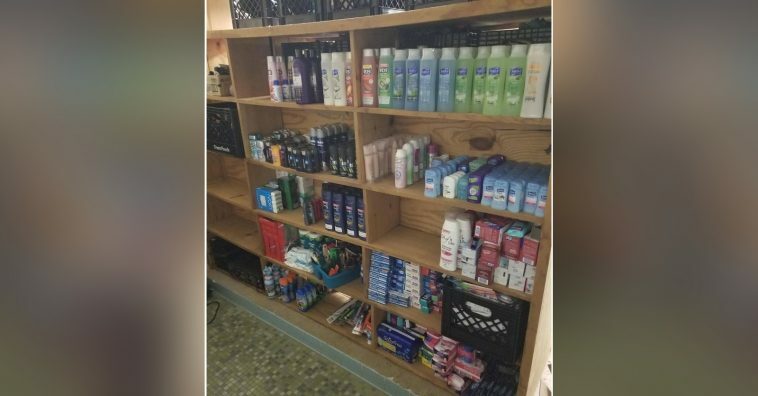 The teacher who set up a free stand for hygiene materials for her students is just one example for that. 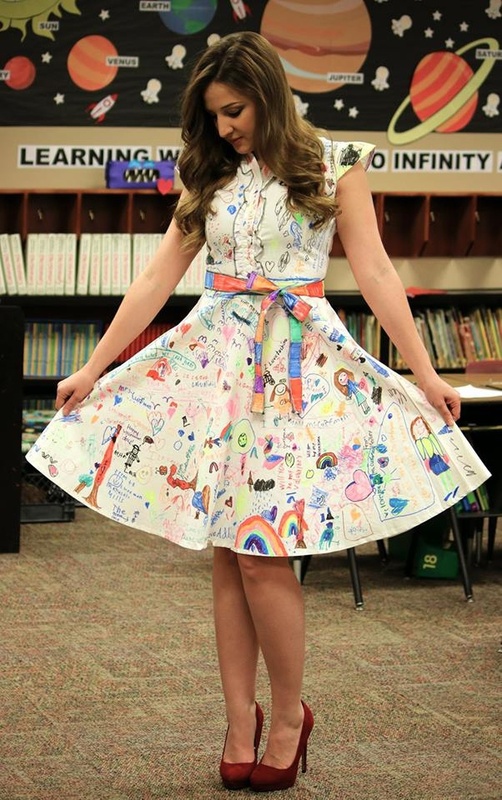 This Oklahoma second grade teacher brought a white dress to school and let her students fill it with their artwork. It is not just a plain canvas covered in children’s drawings; it is a field of expression of feelings, emotions and pure children’s souls. She teaches them to express themselves and their love. 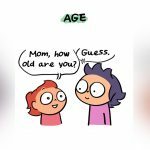 Motherhood is a responsible task, especially when the young mother, besides taking care of home and a little baby, has duties and responsibilities towards her education. 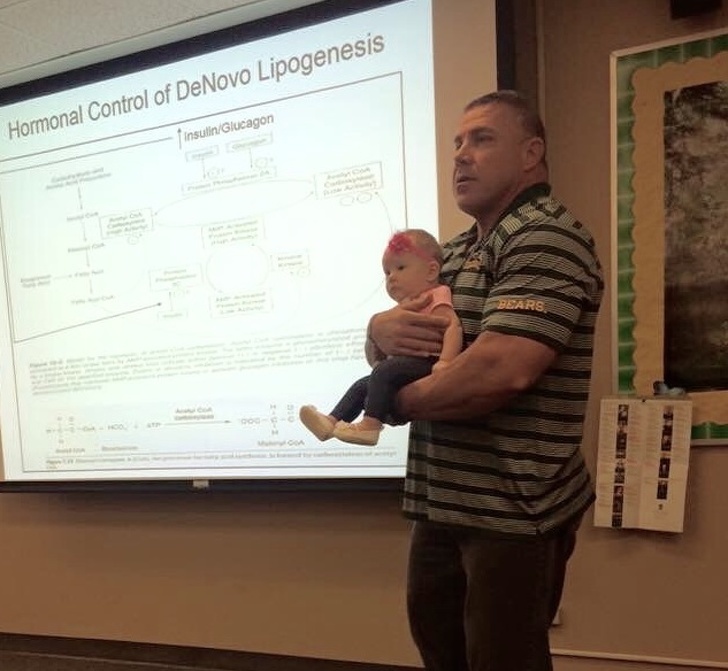 A great moment is when an incredible professor takes a babysitter’s duties and swings the little 4-month-old princess during the whole lecture so that the mother can focus on it. He is just an awesome teacher actually motivates you to go to the university without excuses. The young Kentucky teacher Kinsey French shared one of the happiest days in her life with little pupils with special needs. Her focus is on integrating students who have Down syndrome in the classroom… but not only as you can see. 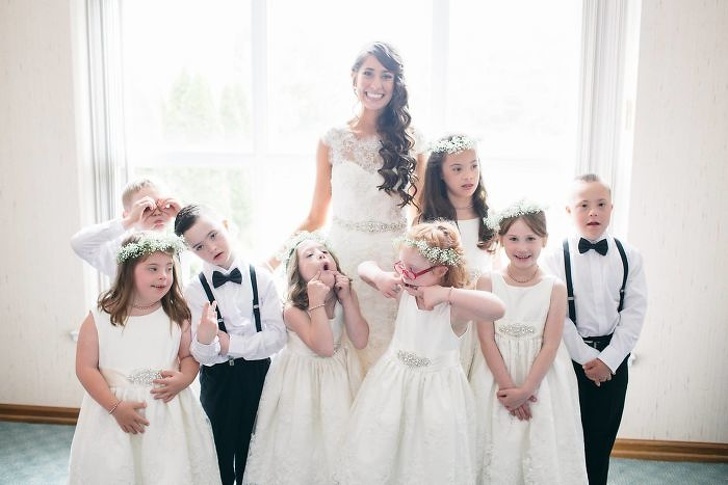 These little bridesmaids and groomsmen are so charming! They were part of the celebration of life & love. Can you imagine their excitement on this unforgettable day!? Struggling with how to help someone through life’s tough times? With a couple of comforting words you could be able to encourage and support someone… but doing it in other ways just to show you really do care is perhaps the greatest act of compassion and empathy. 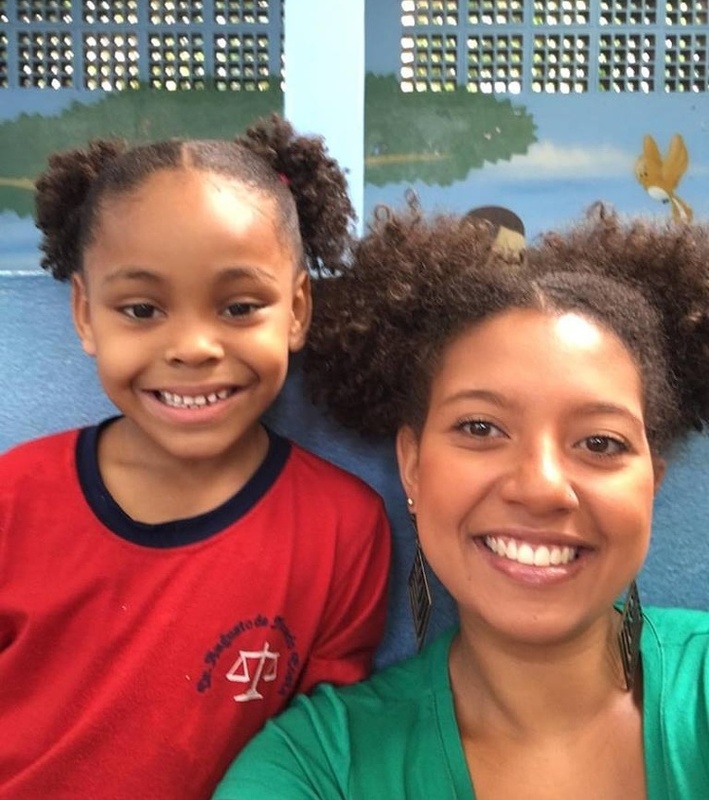 A Brazilian schoolteacher who realized a little girl was being bullied because of her hairstyle changed her own hair to support the little girl. She noticed the girl was sad after a boy said her hair was ‘ugly’. Barbara told the girl that she was wonderful and shouldn’t care about what he was saying. The next day she really showed her support. Ferreira copied the little girl’s hairstyle and told her that ‘today I’m beautiful like you’. It brought back the smile of the little girl, her self-confidence most likelyр too. But this case is different! 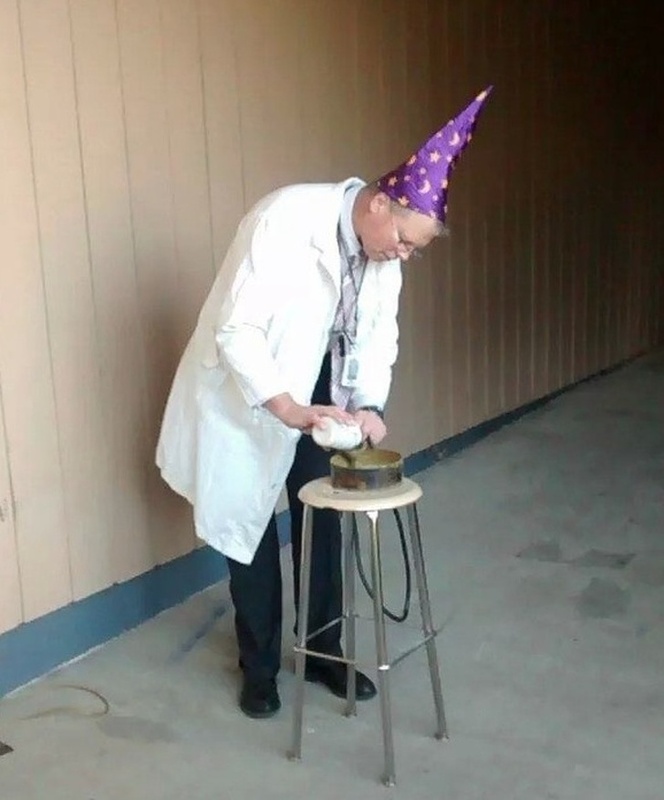 Our magician is a physics teacher who shows his “tricks” to his students. The fact that he is using a variety of tools to attract student’s attention shows how much he is devoted to his profession, and for him it is a vocation. This is a great ability to keep the attention and to show the boring student’s matter as an interesting and fascinating process. Many parents believe it is safe for their children to walk to or back from school without an adult by their side. 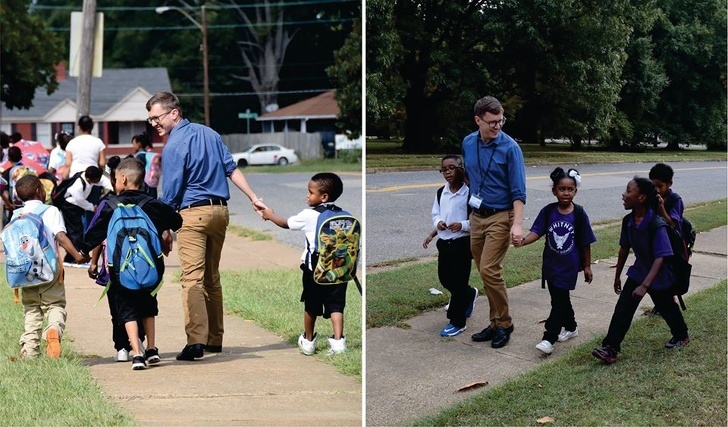 However, Carl Schneider, an elementary school teacher, walks his students home from school every day. This goes to prove us that there are teachers that truly cares about their students. We are sure that he shortens the distance so he becomes part of the children’s world and they accept him as a friend. We could even say this would help bring a meaningful relationship between teachers and students. Smoking cigarettes is an unhealthy habit, especially for teenagers. And what if you even break the rules at school and smoke in the toilets? Is this heroic or stupid? 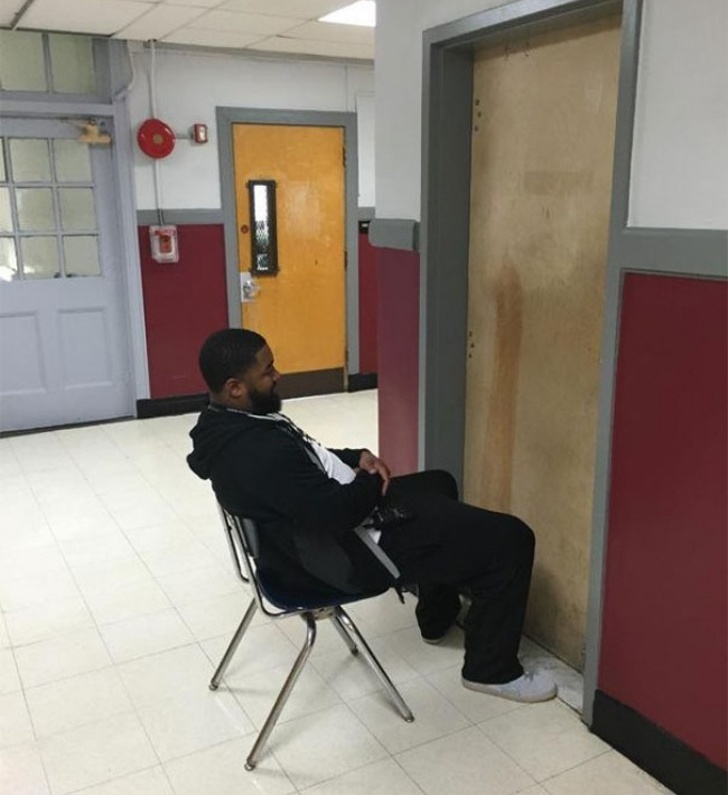 However, we give our applause to the bad cop – the teacher who got his student to do it and showed her who the boss was by sitting outside till she done so he could catch her at the crime scene. Face-to-face with the law is the most effective punishment. 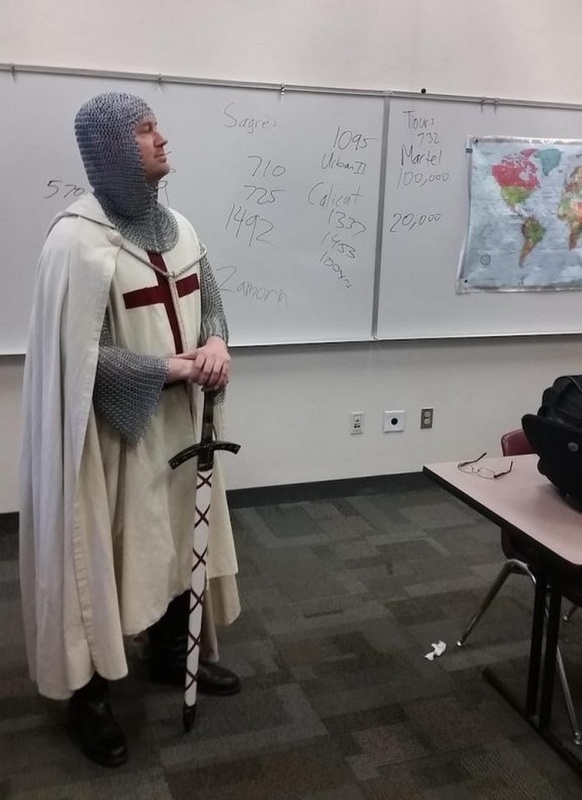 I blame that this teacher has asked himself the question “Why so many of my students hate history — and what to do about it?” He stopped with the clichés and changed his approach to history. He turned it into a story told by a real knight – a crusader. He came up with a way to teach history that wouldn’t bore the kids to tears and to grab and hold their attention. There’s nothing like the father-son relationship. As a boy grows up, there are many people who influence him and his development into adulthood. The father is the most important role model. Unfortunately some young boys do not have a father figure in their life. That is why South Carolina teachers started ’The Gentleman’s Club’ for this kind of children and they teach them good manners and give them fatherly advices. Children need to be confident that they are loved and accepted as they are. To be supported and encouraged, and their good deeds to be praised. They need to be happy and to accept the world as a good place to live. 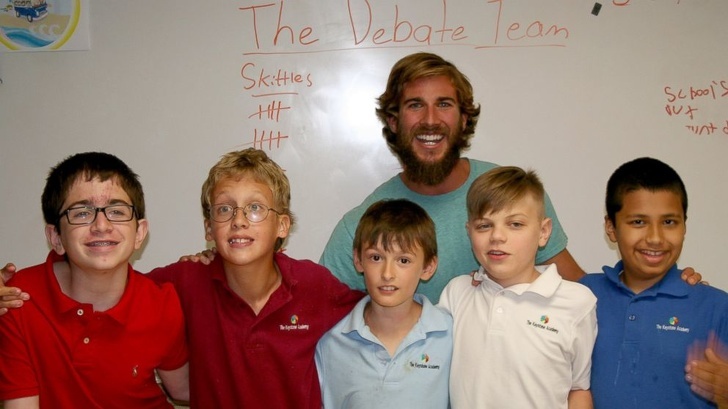 That is why Florida special education teacher Chris Ulmer, starts each class giving individual compliments to each of his students for ten minutes. He does not save good words, praise and encourage them and help them to believe in their own capabilities. He believes that this experience has helped to dramatically increase his students’ confidence and self-esteem. 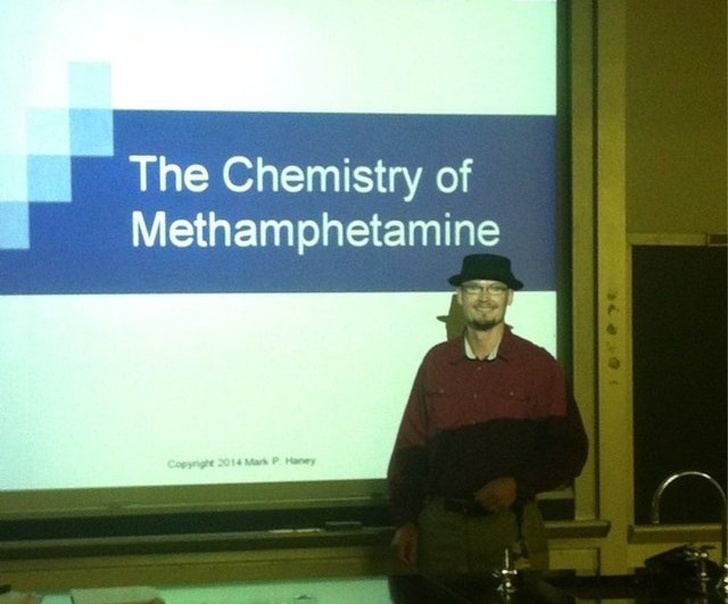 This chemistry professor is dressed up like Breaking Bad’s main character for this class, and his intention was to highlight the minuses of methamphetamines, which he must tell about his students. This is an interesting way to attract their attention and to lead it in the right direction just like the movie character diagnosed with inoperable lung cancer that manufactures and sells methamphetamine in order to secure his family’s future. This is a very dedicated and awesome teacher/human being with a heart of gold. This actually makes us think about how priceless the life is, and how that person really appreciates it. 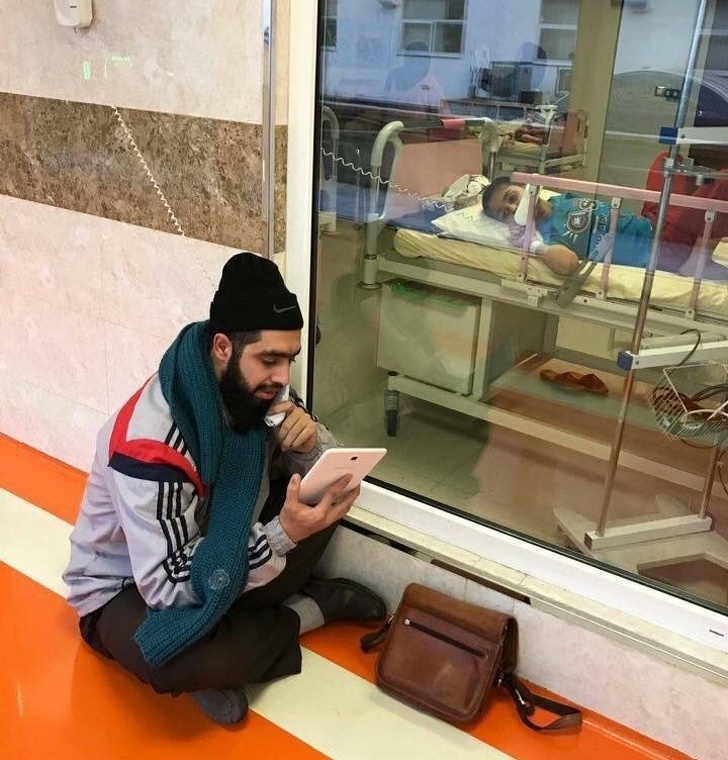 The man visits his young student, who has cancer, every day to catch him up on missed lessons. It is a heartwarming and also a heartbreaking act which has touched so many people, including us. The “Free School: Under the Bridge”, as called by its creator Rajesh Sharma, teaches hundreds of poor children who lives in literally the streets in sheds. He gives his best in teaching these children because otherwise they will become part of a generation lost due to poverty. He also encourages them to get enrolled in government schools so that they can avail some benefits. 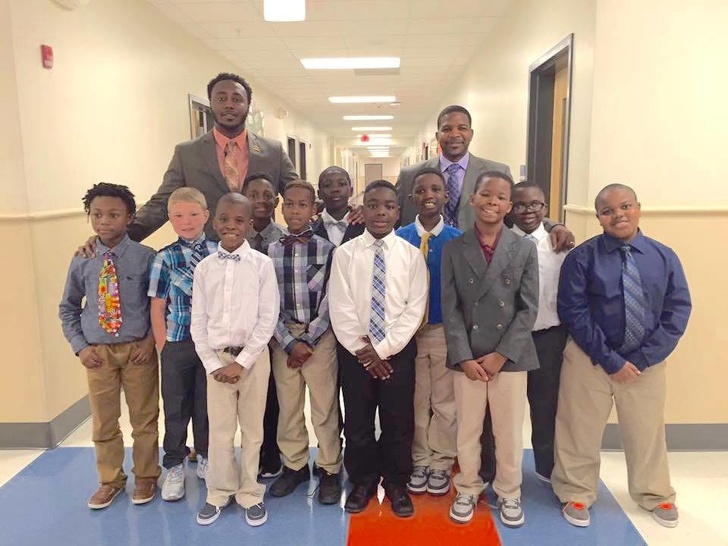 This teacher actually motivates them to go to school and that’s the way it should be. Teaching kids how to use a computer is hard enough already, since they’re kids, but just try doing it without any computers. That was the thing Richard from Ghana tried to do and he did it. The teacher shows how creative and funny teaching could be. He painted himself MS Word on the blackboard in detail to make his students understand what he is teaching. 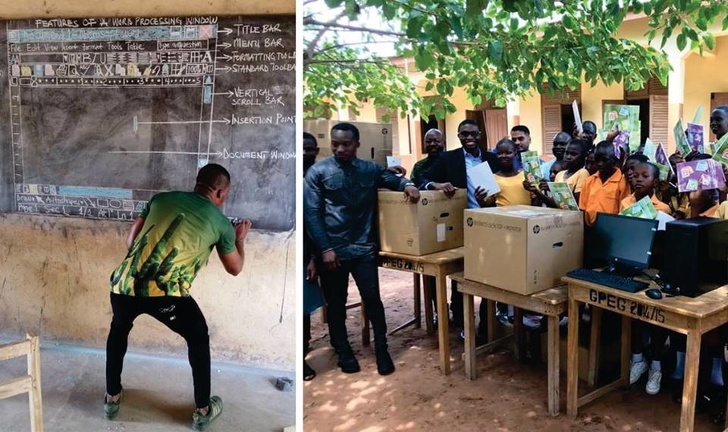 That made a huge difference in their students’ lives because computers were donated to his school by Microsoft. 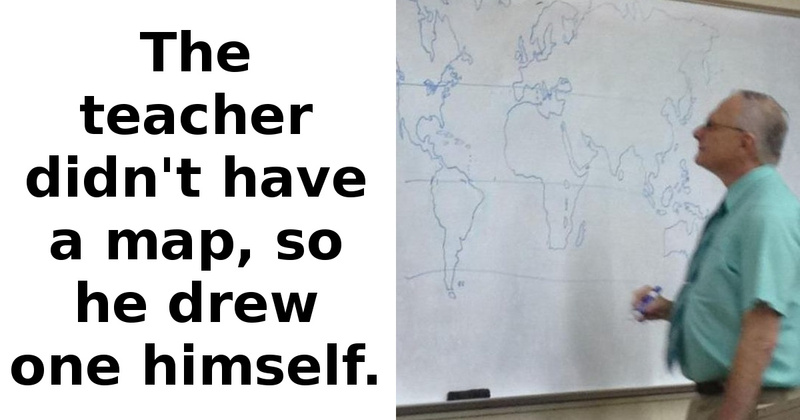 This teacher didn’t have a map for his geography class, so he gave his best and drew one by himself. 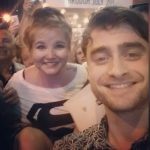 We think that he went above and beyond to inspire and motivate the students and to show there are no impossible things if someone wants to do something. That is why teaching must be a respected and fulfilling profession in our world.